a²(w): Look what I "finished"
You know, because I have to use "finished" in quotes when I talk about quilt tops because there is still so much work before the actual quilt is FINISHED. Both tops were started Monday or after and finished Thursday night. No pattern or tutorial on this one. I know most people use all squares, but I opted to make the long middle row one piece so that I would have fewer seams! Squares are 5", long middle pieces are 14". 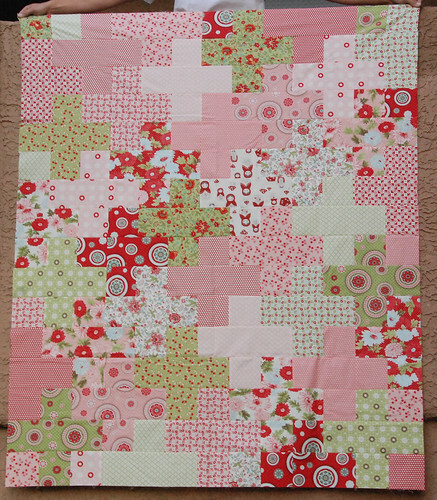 From each FQ I cut 2 14" pieces, 4 5" squares, and then 9 extra 5" squares. 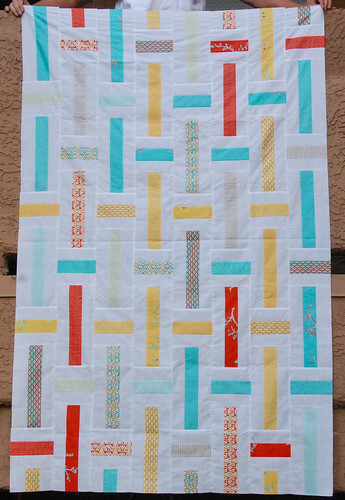 Heavily inspired by Jeni's quilt. ** I bought yardage of Kona Tarragon & Pink (for the back) from Hobby Lobby. PERFECT matches!! This is the Lawn Chair Quilt by Happy Zombie over at the Moda Bakeshop. VERY quick & simple! And I only used 16 City Weekend strips. I divided the rest into pinks and blues that I think I will make into 2 baby quilts.